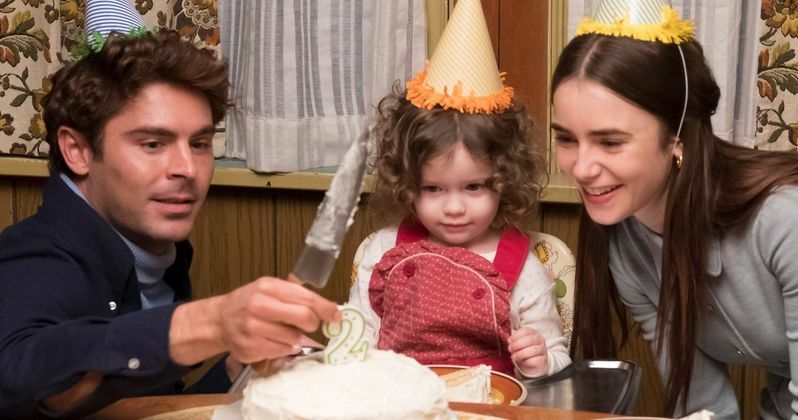 The first trailer for the Ted Bundy biopic Extremely Wicked, Shockingly Evil and Vile is here. The movie stars Zac Efron as the notorious serial killer, set to make its debut at the Sundance Film Festival, which just kicked off in Park City, Utah. Voltage Pictures has decided to release the first footage from the biopic ahead of its debut, which offers a look at the life of one of the most nefariously twisted murderer's in America's history. Much of the story is seen through the eyes of Ted Bundy's longtime girlfriend Liz Kloepfer, played by Lily Collins, who has disappeared into the role. The trailer kicks off with the beginning of their relationship, which quickly becomes complicated as it's clear that her man is not who he says he is. Things devolve once Ted Bundy is put on trial. The trailer is chaotic and paints Bundy as a man who clearly loved the attention of the media, in addition to being a pathological liar who denied his heinous crimes. Tonally, it's a bit less gritty than one might expect, but it certainly turns the whole thing into a spectacle. Extremely Wicked, Shockingly Evil and Vile kicks off in 1969 and centers on Zac Efron as Ted, a handsome, smart, charismatic and affectionate man. At least on the surface. Liz Kloepfer, a cautious single mother, falls victim to his charms. For her, it's a match made in heaven, and she soon falls deeply in love with him. The two are a picture of domestic bliss who seem to have it all figured out. That is, until their perfect life is shattered after Ted is arrested and charged with a series of brutal murders. Concern soon turns to paranoia as the evidence against Ted begins to mount. Liz is left to confront the notion that the man she loves may be a psychopath. Joe Berlinger is in the director's chair, working from a script by Michael Werwie. Interestingly enough, Berlinger is also behind the recently released Netflix true-crime docuseries, Conversations With a Killer: The Ted Bundy Tapes. Ted Bundy was tried in 1979, ultimately convicted and eventually executed in 1989. After more than a decade of denying his crimes, Bundy eventually confessed to killing 30 women between 1974 and 1978 prior to his execution. However, his true number of victims has never actually been determined and possibly greater than that he confessed to. The cast also includes Kaya Scodelario as Ted Bundy's ex-wife Carole Ann Boone, Jim Parsons as lawyer Larry Simpson, John Malkovich as Judge Edward Cowart and Haley Joel Osment. Extremely Wicked, Shockingly Evil and Vile does not yet have a release date set, but we should be hearing critical reactions out of Sundance in the coming days and the studio will likely lay out their release plans shortly thereafter. Be sure to check out the trailer from the Voltage Pictures YouTube channel below.